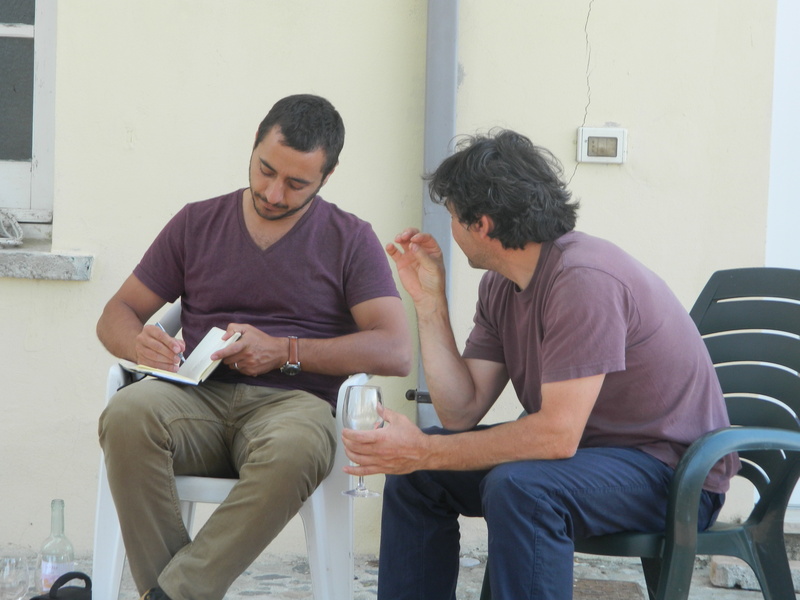 Learning the mysteries of Gaglioppo in Calabria with Francesco and Laura at ‘A Vita winery. The wines are stunning and they are an amazing family with their 3 year old Andrea and 5 dogs. Some of the sweetest people we have ever met. It was quite an experience to be there. Gaglioppo is a crazy grape that resembles Nebbiolo in taste. It doesn’t have a lot of color and it’s actually super pale with almost a brownish note that could make you think that it’s oxidized when it actually isn’t. In the right vintage, like the 2009, and with the right maceration that can go from 4 days to 35 days, it can truly be something outstanding……very similar to a complex Piemontese but at one third of the price. 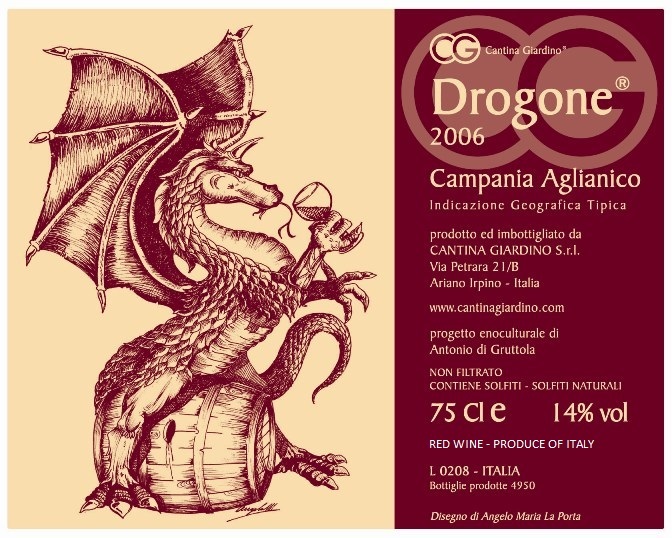 Spices, dried flowers, and cherries….rustic and yet elegant….and full of warm ripe tannins. Extremely drinkable. 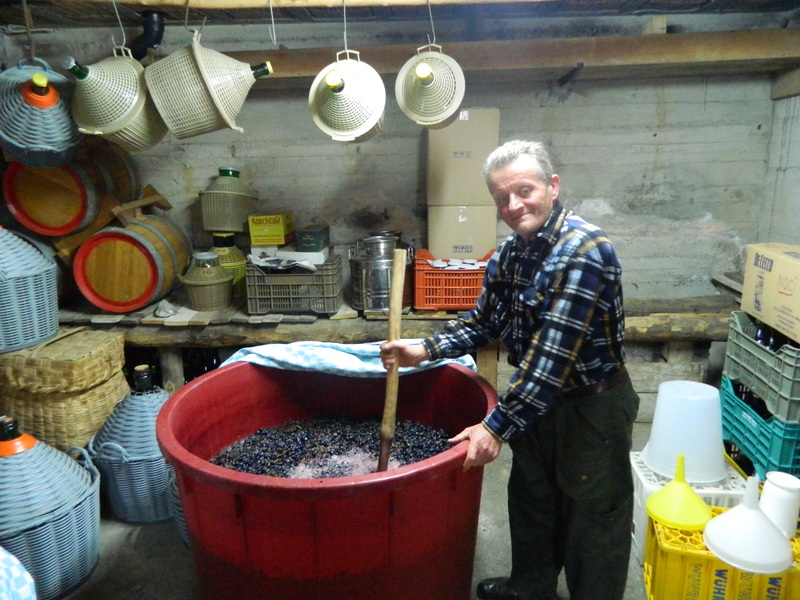 “The maceration is key” says Francesco. “One extra day and the wine can become hard to drink” he explains while we drink the 2010 where the tannins were a bit out of control hitting you with the force of a giant wave. “I am still learning as I go” he admits “but in 2009 I just got it right”. True…the wine was incredible. From my point of view: Gaglioppo is like a crazy horse that needs to be tamed and it can be magic. It can also be fantastic as a Rose’. One of the best I ever had. Even better when you sit outside Francesco and Laura’s beautiful country house as you stare at a 180 degree view of the sea, while the wind blows constant of the secular olive trees. 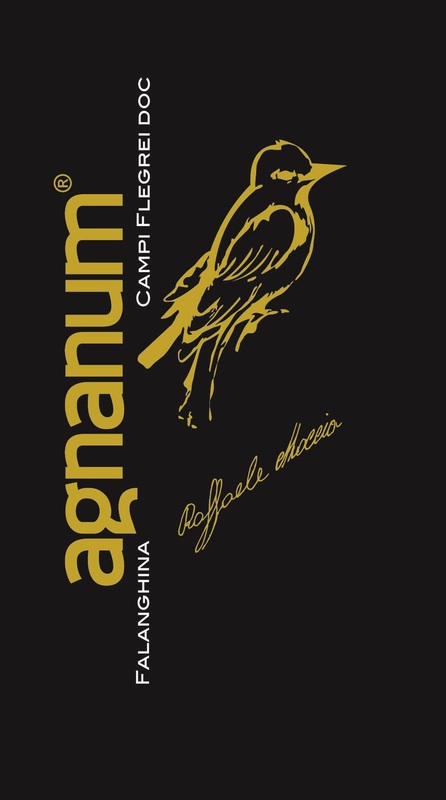 Agnanum is the best producer in the Campi Flegrei area. Very old vines, extremely low yelds, a special soil composition that is extremely mineral and saline. 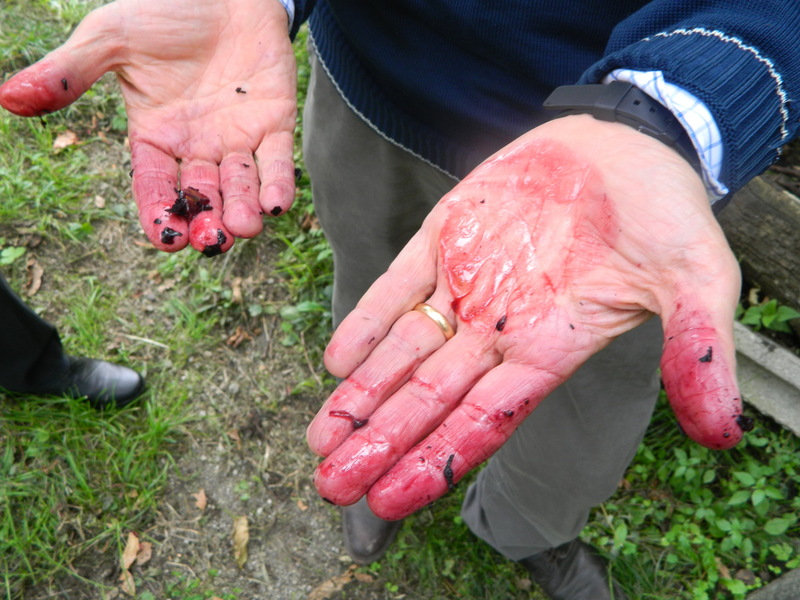 The approach is natural and no chemicals are used in the vineyards and at the winery. In the vineyards, all the work is done by hand. 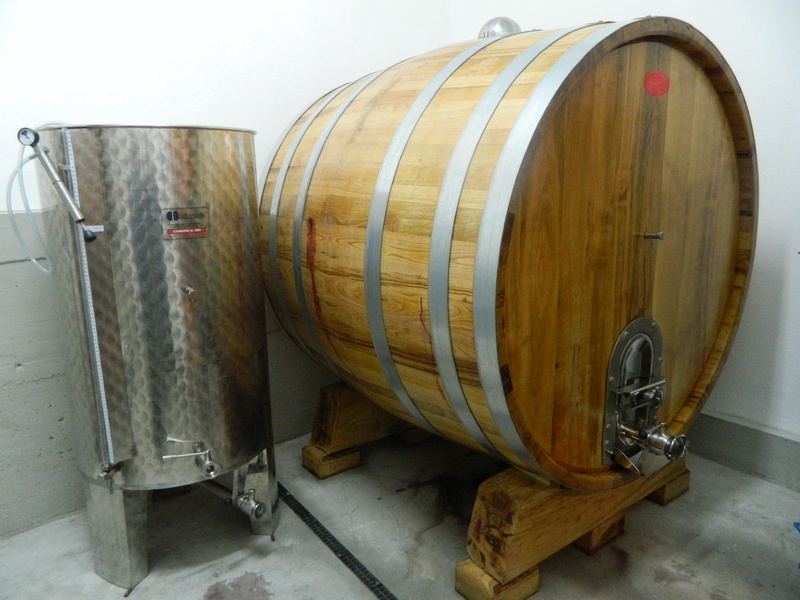 At the winery after a fermentation that starts with natural yeast, all the wines are elevated in steel or large barrels. The wines are just awesome and the prices are very honest. The Falanghina 2012 is back. Smocky, minerally and saline. Full of ripe citrus notes and super long.The alcohol is only 12%. The price is $17.00 per btl. Email scuoladivino@gmail.com if thirsty. Claudio Ancarani is the latest addition to our small portfolio. His winery is in Santa Lucia, a little town next to Faenza in the Romagna zone. He is a true Vignaiolo and spends most of his time in the vineyards that he inherited from his grandfather who taught him how to make wine. He is a non-interventionist: indigenous varietals, organic grapes manually picked, native yeast,no manipulation of any kind, no oak barrels but vitrified cement instead. 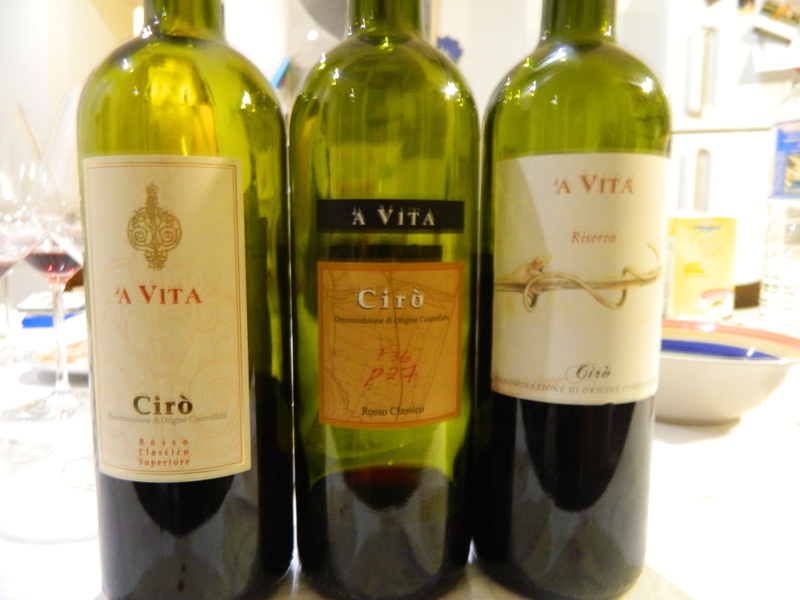 Claudio’s wines are intense, full of nuances and shades of freshness, with good body and agility. 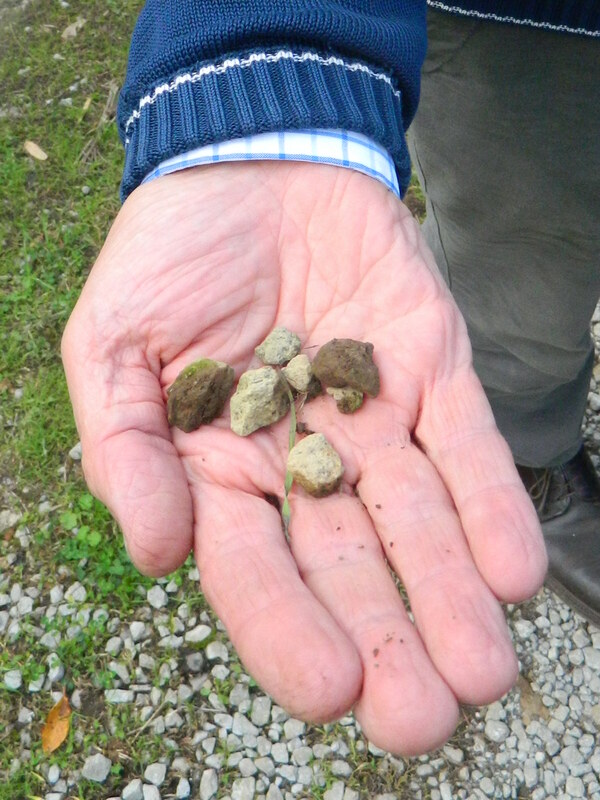 This intensity comes from the soils that are a combination of clay mainly with smaller percentages of lime and sand. Claudio doesn’t believe in the use of any type of oak because he only wants the pure flavor of his grapes to shine. Using oak would mask nuances and add spices that don’t belong. I can’t blame him. All of his wines are truly terroir driven with a perfect equilibrium of drinkability, structure, and elegance. ALBANA SANTALUSA 2011 Golden and rich, it’s powerful and warm like a great Albana should be. Full of aromas of yellow peaches, nectarines, honey, and mineral notes. It is deep and creamy thanks to the late harvest of 1/3 of the grapes. On the palate it’s a game between softness and firmness kept in check by the good acidity. A happy wine that doesn’t hide. It will easily stand up to white meats or an intense cheese and will age beautifully. SANGIOVESE BIAGIO ANTICO 2011 A Sangiovese that you can drink every day. Agile and full of nuances. Blackberries and cherries but the word that comes to mind is freshness. Light and drinkable and extremely food friendly. It was the winner at my last meal at Central Kitchen with my friend Gene Tomko. SANGIOVESE ORIOLO 2011 A single vineyard Sangiovese with more power and structure than the Biagio Antico. It’s darker and full of dark and red fruit. On the palate it’s earthy, deep, and warm. Still elegant and drinkable but in need of a rich pasta or red meat. CENTESIMINO 2011 A graceful wine where the aromatics of the Centesimino grapes are jumping out of the glass: violets, rose petals, more flowers (I am not the best at describing which kind), blueberries and raspberries. Warm and clean on the palate with a beautiful salinity with soft tannins and an almond finish. Perfect wine to have with Asian food or aromatic cheeses. CENTESIMINO PASSITO 500 ml The iconic wine of the winery. 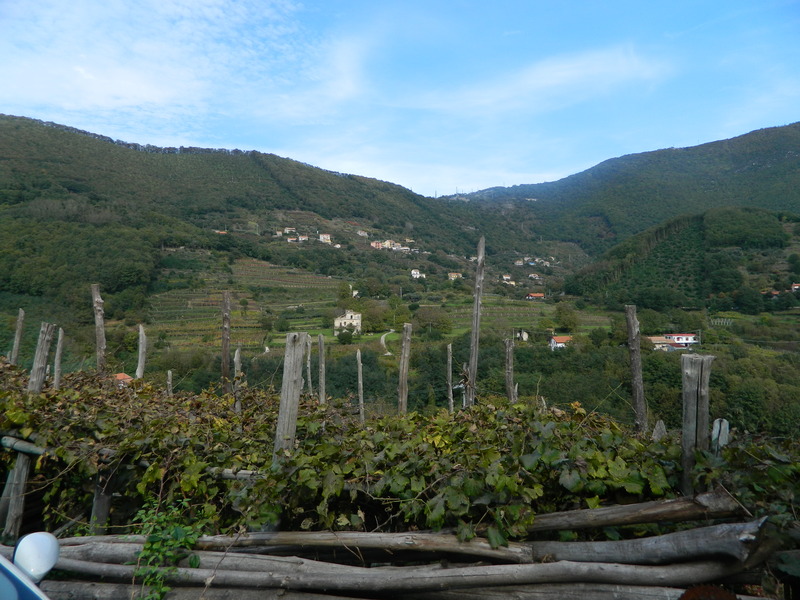 A passito (dessert wine)…the grapes were left to raisinate on the vines. Crazy nose of blueberry, red currant, prunes, cocoa, and amarene cherries. Simple but captivating and not overly sweet. The acidity is high and keeps the palate fresh. The perfect pairing would be a cheese cake or a blue cheese. 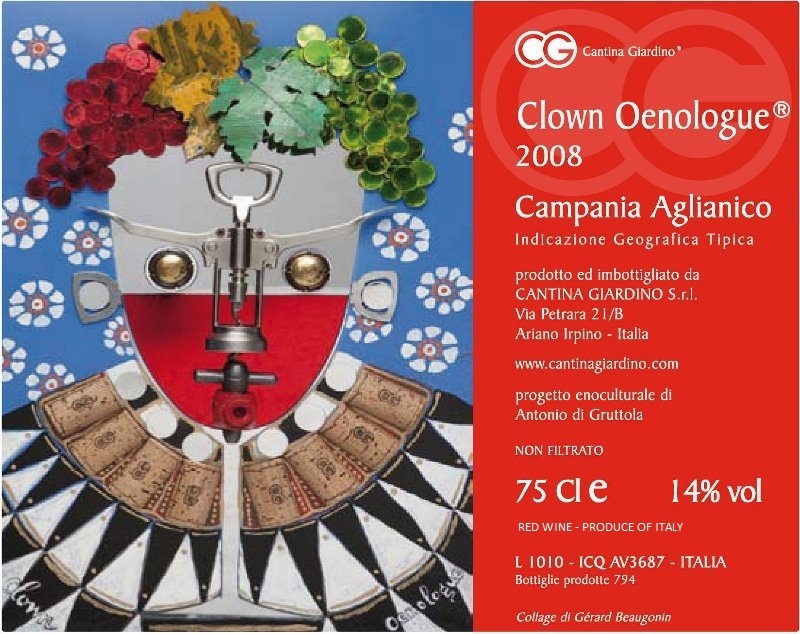 THE AGLIANICO “CLOWN” FROM CANTINA GIARDINO 2009 IS THE MOST EXCITING WINE THAT WE CARRY AT THE MOMENT IN OUR SMALL PORTFOLIO. ONCE AGAIN, ANTONIO DI GRUTTOLA SHOWS ITS GENIUS.I RECENTLY OPENED A BOTTLE AND I WAS BLOWN AWAY BY HOW GREAT IT WAS. 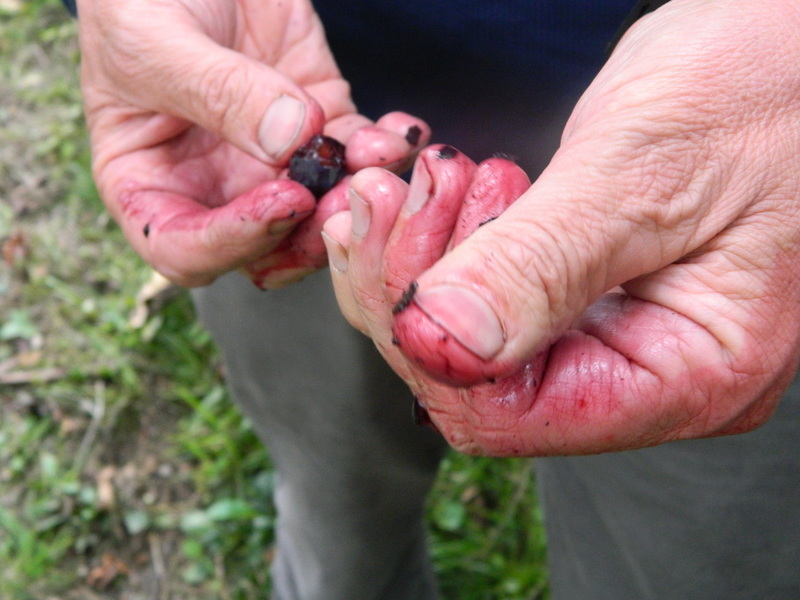 THE GRAPES ARE NOT DE-STEMMED (WHOLE CLUSTER) AND THEY ARE FOOT PRESSED. NATIVE YEAST STARTS FEEDING. 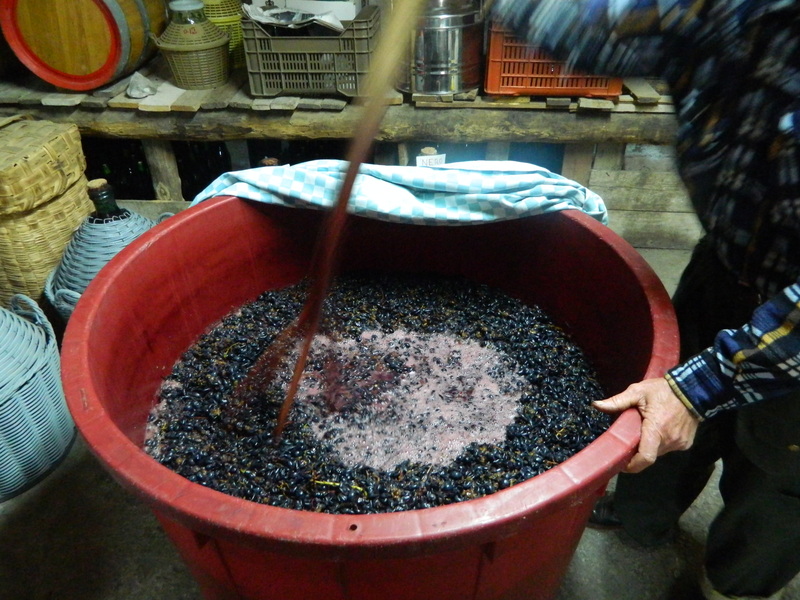 NO SULPHUR IS USED DURING WINE-MAKING AND AT BOTTLING. NATURAL WINE ALL THE WAY…. THIS WINE IS FRESH, INTENSE, PURE, COMPLEX, WITH JUMPING OUT OF THE GLASS AROMAS OF DARK AND RED FRUIT, FERMENTED CHEESE, AND SMOKE.THE 1 YEAR MACERATION IN ANFORA HAS PAID BACK ON THE FRESHNESS AND PURITY AND SINCE THE WINE HAS BEEN DELICATELY FOOT PRESSED, THERE IS NO ASTRINGENCY AND BITTERNESS. IT KEEPS GOING ON THE PALATE ALMOST EXOTICALLY AND EVERYTHING IS IN CHECK THANKS TO THE EXCELLENT ACIDITY.IT IS GREAT AND HARD TO RESIST NOW BUT IT CAN PROBABLY AGE FOR ANOTHER 10 YEARS. 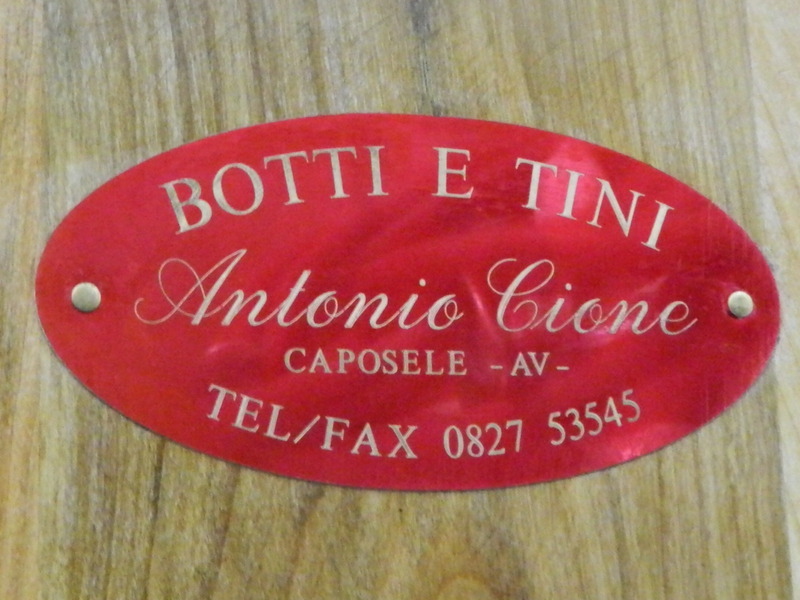 IT IS A TRUE MONUMENT OF AGLIANICO D’IRPINIA THANKS AGAIN TO CLEVERNESS OF THIS NATURAL WINE-MAKING MAESTRO. 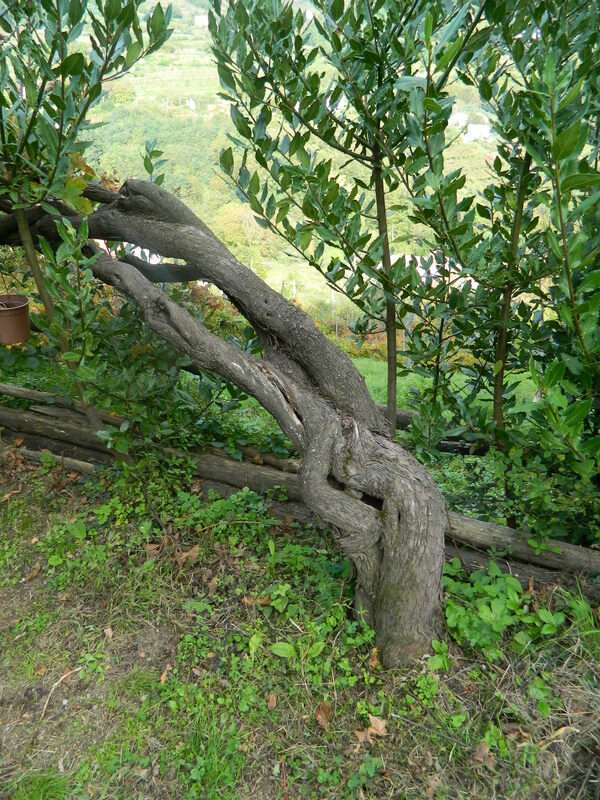 JOIN US WEDNESDAY DEC 18TH AT 6PM AT BIONDIVINO : 1415 GREEN STREET, SF, CA, 94109 “RE-THINK CAMPANIA”. THE EVENT IS $10. IF YOU LIKE PAOLO BEA’S WINES BUT YOU WANT TO SPEND 1/2 THE PRICE…..THIS MIGHT BE THE EVENT FOR YOU! WE’LL BE POURING SOME OF THE NEW EXCITING-EXTREME-NATURAL WINES FROM CULT PRODUCER ANTONIO DI GRUTTOLA OF CANTINA GIARDINO AND PRESENT THIS REVOLUTIONARY WINERY. 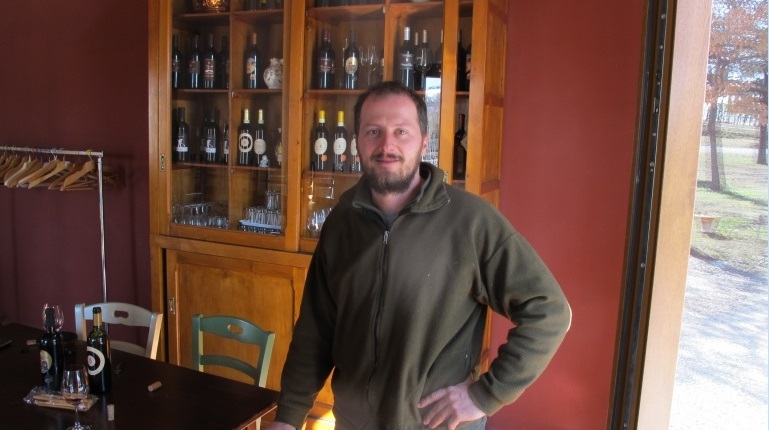 Giulio Stefanini is the top vino sfuso maker in Tramonti. 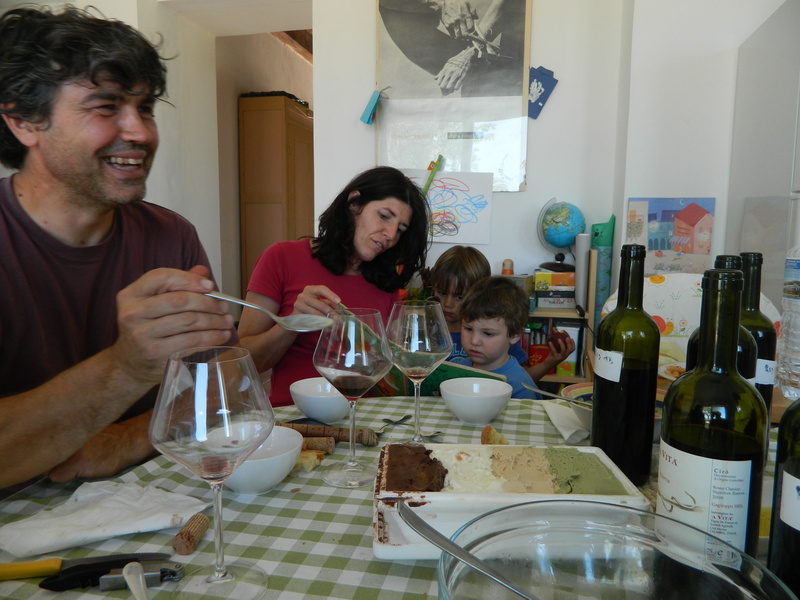 Vino sfuso is wine that you drink every day at the family table. He fills empty Heineken bottles of this awesome juice and there is no label whatsoever. 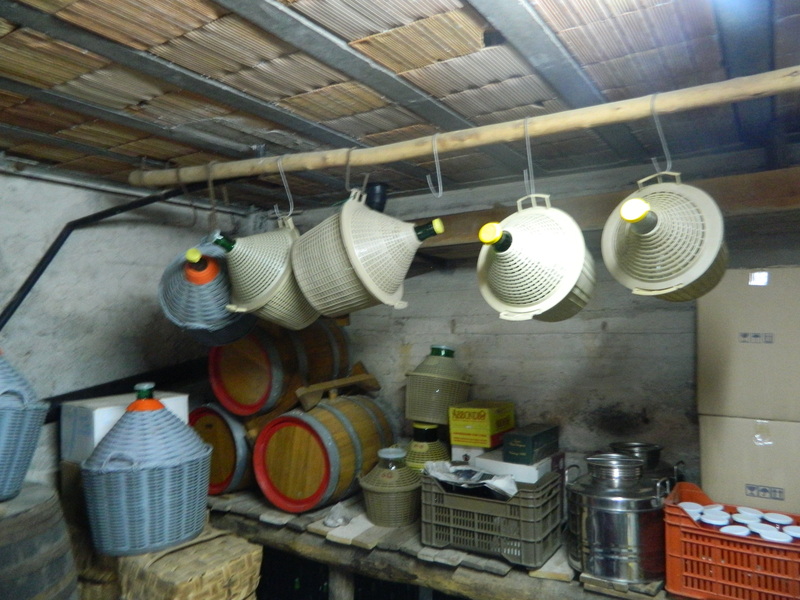 It is true Vino Naturale (natural wine) because there is nothing to preserve it and nothing is used in the vineyards.Everything is done by hand and the wine is elevated in glass demijohns.It’s not for sale but it’s for family and friends only. I am lucky enough to be a friend of Giulio and every time I visit Tramonti, he shows up at the door with a few bottles of his Bianco (peppella, biancatenera e ginestra), his Rosso (tintore), a bag of porcini mushrooms, a couple of his homemade salami (his salame is also legendary) and a few cases of apples. His wine has a bit of spuma at times (CO2) and there is nothing better to drink with the local cuisine. It is rustic, fruity, gamey, drinkable and complex in its simplicity. I have been begging Giulio to consider putting a label on part of his production so that I can bring it all the way to the US but Giulio is a stubborn man and I doubt that I will ever be able to share his awesome sfuso with my firends in SF. 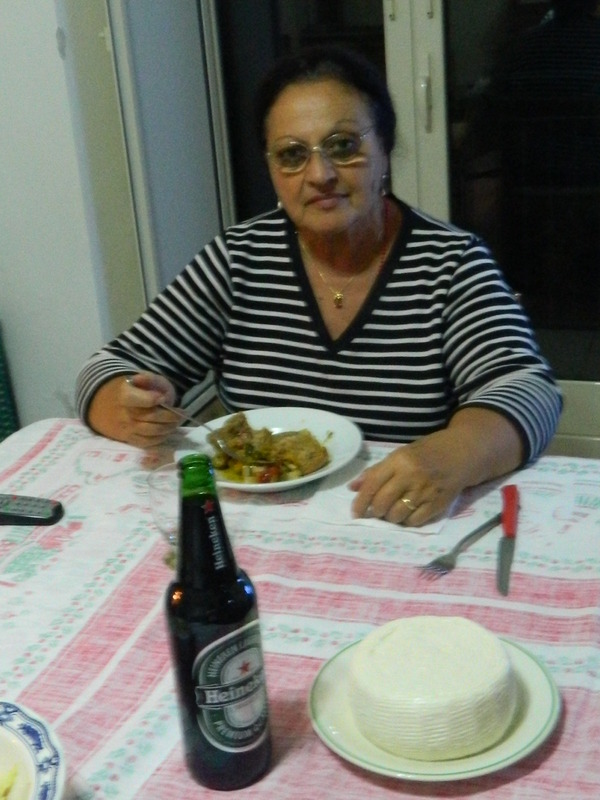 Below some photos of Giulio in action and a photo of mamma Rosaria having some pane e biscotto, some of Giulio’s Sfuso in a Heineken bottle, and an awesome fresh pecorino. The wines of Montegrazia are finally here!! 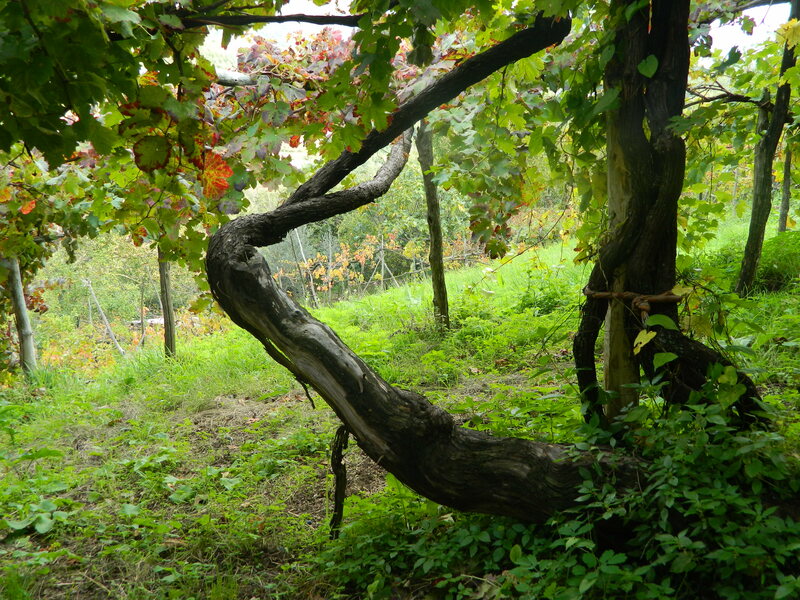 Tramonti is one of the few pre-phylloxera areas in Italy thanks to its natural isolation. 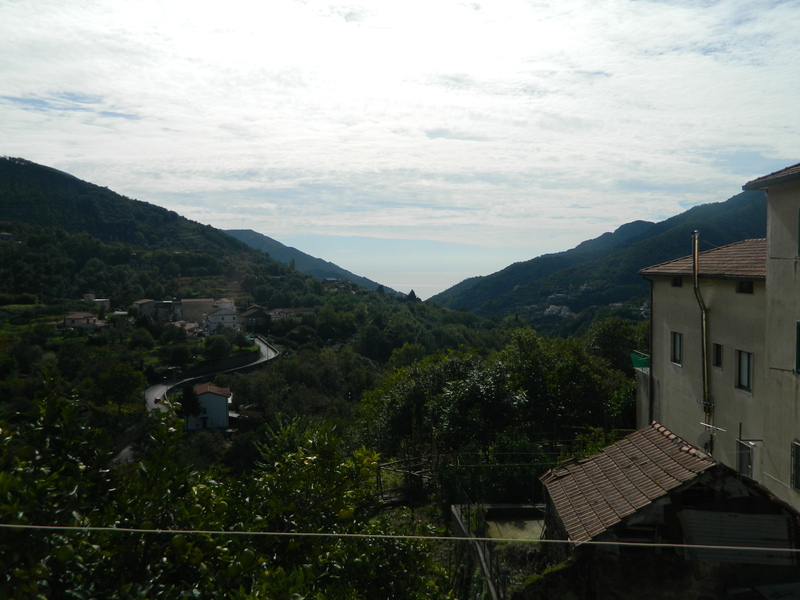 It’s completely surrounded by mountains and facing the sea. It’s divided in 13 picturesque tiny towns and most families still live off agriculture. Dr.Arpino from Monte di Grazia is my opinion the best and most ethical wine producer of the area. He works naturally and only with indigenous grapes. There is no cheating in his wines. 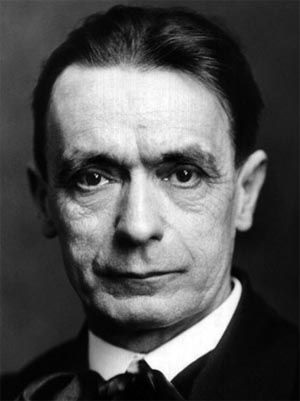 Falanghina (that doesn’t belong to this zone), for example, is not used in his white. 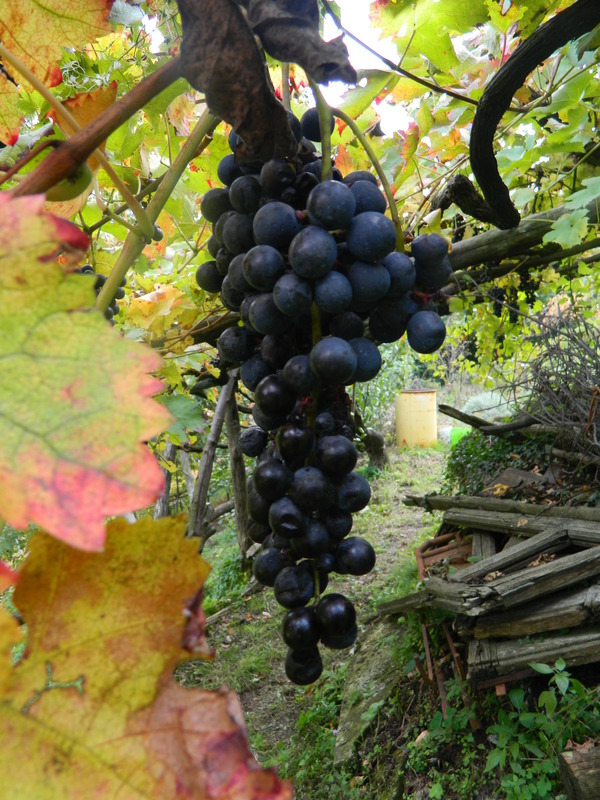 Also, there is a rumor that the other wineries in the zone buy fermented must from Avellino or Benevento to produce more wine or to elevate the alcohol level. But at Monte di Grazia things are done right. 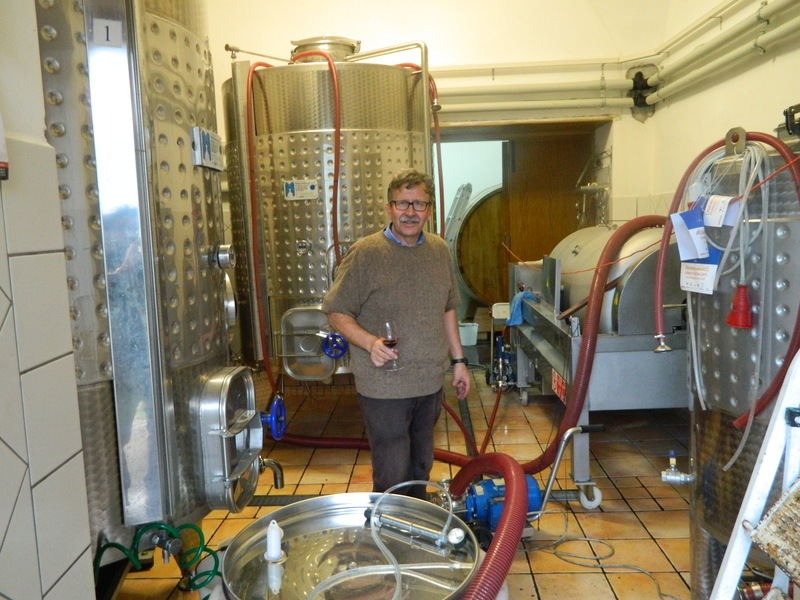 Dr.Arpino makes 3 wines: Monte di Grazia Bianco (Pepella, Ginestra, Bianca Tenera), Rosato (Tintore and Moscio), and Rosso (Tintore and Piedirosso). The soils are of volcanic origin and the centenarian vines are cultivated organically. If something hits, peronospera especially, he can easily lose most of his production. The vinification is natural with just a bit of sulphur used at bottling. The elevage is in steel and large chestnut botti. No French, American or Slovenian oak is used but local old-school chestnut. The total production is 5.000 bottles. The wines are clean, minerally, smoky, and firm. They can easily age for 10-15 years. We brought in small quantities and we recently obtained our license to sell to individuals online. We will update our website soon, making it easy to purchase wine online. 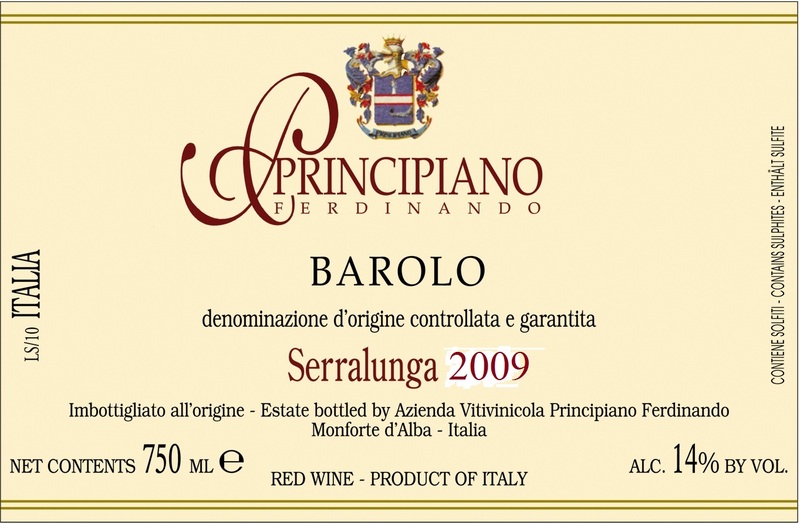 Every time I drink the Dolcetto D’Alba 2011 from F.Principiano, I am always impressed by how delicious it is. 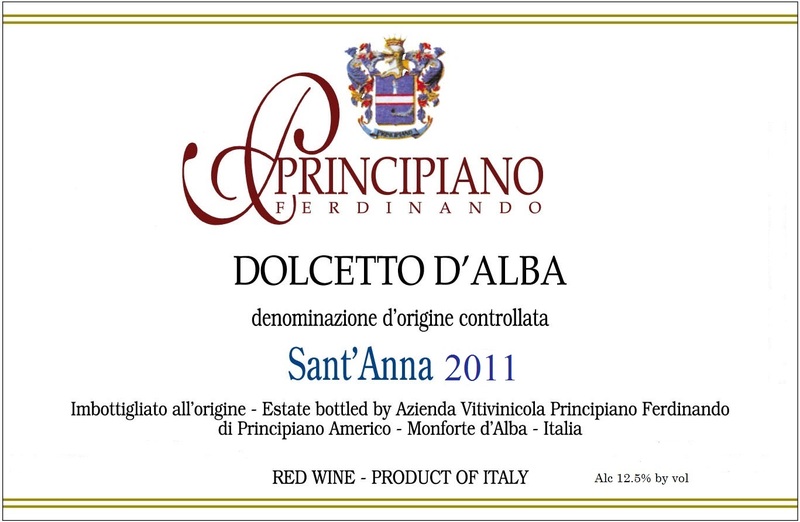 This is a Dolcetto Classico made from the Sant’Anna vineyard in alta langa….the Dolcetto zone where soils are richer in clay. 40 year old vines, 15-20 days fermentation, 10 months in steel, no sulphur during winemaking…(no micro-oxygenation)…and here it is at 12.5%!! It’s the perfect lunch wine with great earthy fruit and vibrant acid and those beautiful sweet tannins that are common to this grape. If you can find me a better Dolcetto in SF….call me! !